"AFSCME Council 18 joins New Mexico Women, families, our sister organizations, and this community call for action to #EndFamilyDetention. We express our outrage that migrant children are in cages, jails, and separated from their parents," said Connie Derr, Executive Director Council 18. "We are adding our voices to this call for a return to basic human decency." Wear your AFSCME Green Shirts! This isn’t the first time our country has taken children from their parents. Children of slaves were sold to the highest bidder, Japanese children and their families were incarcerated here in New Mexico during WWII, Native children were forcibly sent to boarding schools. Governor Susana Martinez supports Trump’s racist policies against people of color. During both of her campaigns for governor she fanned the flames of injustice and hate against immigrants and their families. At Trump’s request she has sent New Mexico National Guard Troops to our border with Mexico. Wasting money that could be spent for mental health, health care, education, eradicating homelessness and other social needs for New Mexicans. The governor supports the Trump policy of jailing migrant children and sending them to the far corners of this country. IIt is child abuse. Issue a statement to President Trump denouncing the policy of removing children from their parent and imprisoning them. Demand that the President immediately reunite every single child that was stolen from her or his parents. Terminate Contracts with all Private Detention Centers. 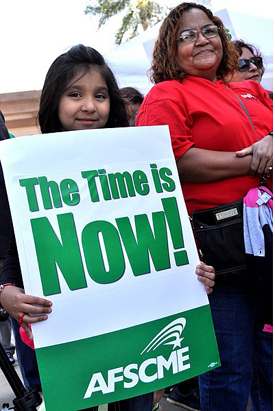 AFSCME joins the New Mexico Women's March, partner organizations New Mexico Dream Team, March for Our lives, and the New Mexico Poor Peoples Campaign. Join us this Thursday 6/28/2018 at 3pm - East side of the State Capitol Building.